One of the duties of a farm apprentice is staffing the market cart at the base of campus where organic fruits, vegetables, and flowers are available to the public. “But first I have to learn how to grow the food,” says Edwards, 36, who had never farmed in his life until he arrived at the 30-acre teaching farm at UC Santa Cruz earlier this spring. Edwards played six seasons with the Detroit Lions before signing a two-year contract with the Oakland Raiders in 2008. At six-foot-six and 265 pounds, he played in 101 NFL games and is credited with 165 tackles and 31 sacks. Today, he is an apprentice at the Center for Agroecology and Sustainable Food Systems (CASFS) ecological horticulture program, an immersive six-month curriculum that trains future organic farmers, gardeners, teachers, and community leaders in environmentally and socially responsible farming methods. The apprenticeship program began at UC Santa Cruz in 1967 with English master gardener Alan Chadwick and is beginning celebrations to mark its 50th year. 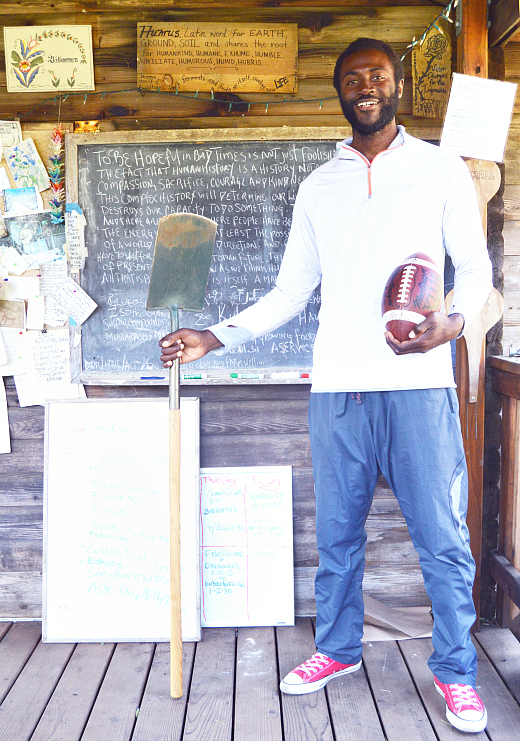 Enrolling at the ecological horticulture program is part of a new life journey for Edwards that began when his professional football career ended in 2010. Edwards had just retired from the Oakland Raiders and was back home in Georgia when he experienced overpowering memories of his great grandmother. She passed away when he was in middle school and he says he was too young to appreciate how much she did for the community. He had flashbacks of her funeral, an event where the whole town flooded the local church to pay their final respects. He remembered summers with her, eating only rice with ketchup. He remembered carrying heavy grocery bags home on the bus and preparing meals to feed hungry neighbors in need. Food and community was a recurring theme. Realizing how this one woman impacted so many lives made Edwards feel as though there was more than the fast cars, big houses, and expensive jewelry that defined his life after he turned pro. Edwards felt an overwhelming desire to do more. Lenny Williams, his best friend and former teammate on the University of South Carolina’s football team, encouraged Edwards to help him feed the homeless. Williams was working at a hotel at the time and would bring extra food and leftovers into the homeless community in Atlanta. “I woke back up,” Edwards says. With Williams, Edwards began regularly feeding the homeless. He wanted them to have hot, home-cooked meals like his great grandmother had made. So he and Williams would prepare mashed potatoes, collard greens, and beans with organic ingredients sourced from their local health food stores. They would make trays of macaroni and cheese. Edwards also bought socks, blankets, and other things that the homeless said they needed. But Edwards’ boldest move was when he decided to give away all his possessions. Edwards moved into a small apartment in the same town where his great grandmother had once lived. He devoted his time to religion, spirituality, and his community. “One religion led to another religion,” Edwards said. He reread the Bible, the scriptures, and the New Testament. He studied Hebrew. He picked up the Quran and the Bhagavad Gita. He dipped into Buddhist philosophy and went on week-long meditation retreats. In addition to preparing meals for the homeless, he mentored drug addicts at the local jail. He learned about herbs, healing, and alternative medicines. He became a vegan. But he soon realized that he did not know how to even grow the food and herbs he depended on. “I was a slave to the system,” says Edwards. 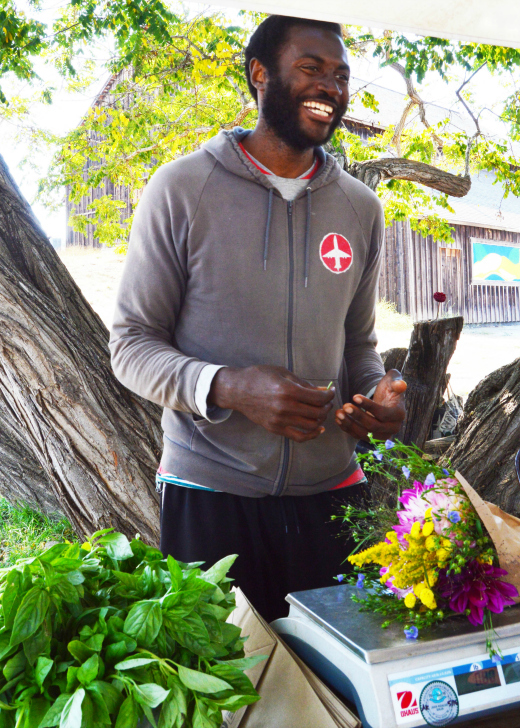 He thought he should know how to become self-sufficient and start his own organic, seasonal farm that could feed his community’s homeless population. He came to the CASFS apprenticeship program to learn more. Now the former football star is poised to do something bigger: “What if you could develop not a farm but an entire ecological system that could produce food all year round,” he asks. “CASFS changed my vision,” says Edwards, who is deeply concerned about food security and sustainability. He sees a future in perennial farming and permaculture that he learned from fellow apprentices. “I’ve learned as much from the other apprentices as I have my teachers,” he says. He plans to continue his agricultural education with courses in soil biology and permaculture, and spend several years working in an agroforestry system. Edwards hopes to develop his own sustainable food system with trees, shrubs, and bushes that can sustain communities year-round, and not end when the growing season is over. Since 1967, more than 1,500 graduates of the Apprenticeship in Ecological Horticulture have applied their training around the world, developing commercial farms, market gardens, and Community Supported Agriculture (CSA) projects, starting inner-city community gardens, working as environmental educators, participating in international rural development projects, managing organic landscaping businesses, and pursuing advanced degrees in agricultural studies. In 2017, the program will mark its 50th anniversary with a series of public events and celebrations. Learn more at casfs.ucsc.edu.